Last week, developer Tom Waddington uncovered Facebook code that points to the creation of a “Want” button — a plugin that potentially points to a new kind of commercial innovation being developed by Facebook itself, different from “want” buttons already being developed by third parties (one example here), and partially working but only within Facebook’s Graph API tester. He’s continued to dig around and today has presented us with some of his latest finds: looking deeper into Facebook’s code, he found more references that point to how Facebook might be thinking about how users can share purchasing information with each other. The presence of a “Want” button and these related commercial actions point to ways that Facebook can continue developing other streams for revenue-generation to complement what it is doing in advertising and existing commercial services, such as in-app purchases. Playing around with the Want action, Waddington focused on the object of the Want action, called “ogproduct”. “I think they’re using ogproduct while testing – it’ll move to product when [if] it goes live,” he says. While looking around in the ogproduct code, Waddington found code for a “product.purchased” action, with options underneath for a donation, message, product, and game_item. While Inside Facebook has pointed out how the Want button would be useful for indicating purchasing intent, versus the more general “Like” button — and subsequently enabling more targeted ads against Wants — these newer details potentially give a clue as to what kinds of purchases Facebook could enable, and allow to share on your timeline. Donations could be about charitable donations; but they could also be about group donations for purchases or events (similar to what Crowdtilt does today). Product and game_item also seem pretty straightforward. “Message” less so: could that be a way of incorporating an element of the social gifting service Karma, which Facebook bought in May? Facebook has told us, in response to the emergence of the “Want” button, “We’re always testing new Platform features, however we have nothing new to announce.” But in addition to the kind of detail mapped out above, there are other signs that a social commerce product might be closer than you think. 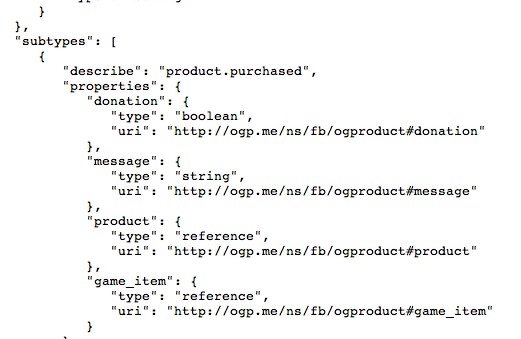 “It’s clear that Facebook is working on a new OpenGraph representation of products. They’re even calling the current Product object ‘Product Old’,” he writes in his blog post. And the presence of a tag within the “Want” button code, for “socialcommerce”, also shows that this may not just be about purchasing intent, but actual purchases, too. There is another interesting detail to add to these commercial hints: among the patents that Facebook owns or is applying for are some related to e-commerce (“Systems and methods wherein a buyer purchases products in a plurality of product categories”, U.S. Patent Number 7,188,080; and “Method, computer product and apparatus for facilitating the provision of opinions to a shopper from a panel of peers”, U.S. Patent Number 7,526,440). You can start to see how all this could be part of a big plan finally coming together.